It is a tricky situation to keep kids safe when walking on roads. Parents do ensure complete safety of their kids while in home, but in certain scenarios ignore the safety rule while walking on the roads. As a parent, you may not be aware about road safety concerns of kids until you start taking them to the school bus stop or in local shops. They are highly excited in certain situation and may lose your control, leading road accidents. It is important to teach traffic and road safety to kids’ right in the beginning. Making traffic rules for kids are important and pushing them to follow it. As a parent, you need to create a safe environment for your kids that can stay in their mind as their age grows. Parents generally opt for a school bus for safe transportation, but it is important to do more to make kids know safety rules to be followed. Unlike adults, kids lack maturity and understanding of complicated rules. Without having supervision from adult and knowing the rules, it is dangerous for kids to walk in the road. There should be no compromise in the safety of the kids. Teach about the road safety rules to kids as they grow up and make them understand its importance. This article presents you with tips and traffic rules for kids you can set and give a responsible upbringing. There are different signs for stop, move, pedestrian walk, etc. Green means “Go” Red means stop, Yellow means slow down, Walking man sign means cross the road and Don’t Walk means never cross the road. Teach your kids about such traffic signs that can stay in their mind as they grow up and walk on the road. One of the road safety rules is to check both the direction while crossing the road. 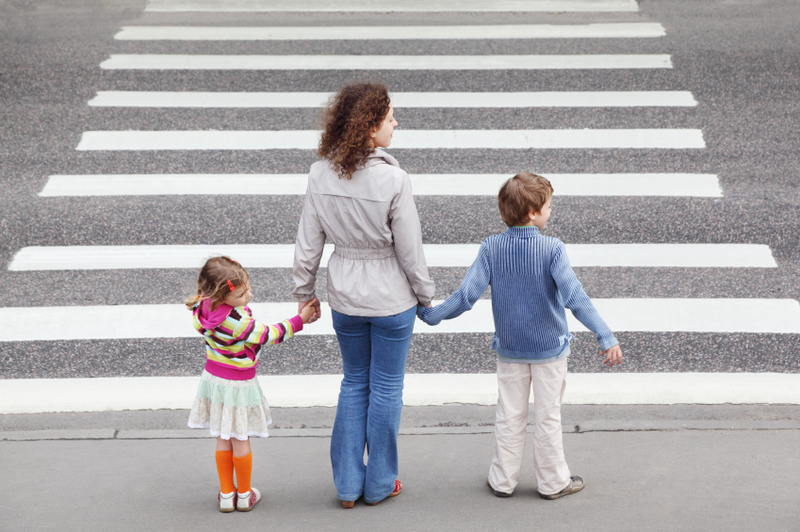 Tell your kids stand on one side of the road until they feel comfortable in crossing. It is important for them to pay heed on such direction rules. In some cases, kids may not be able to see the approaching vehicle, especially when standing at the bend. Therefore, it is important for them to keep their ears open and concentrate on the road while crossing. Running while crossing the road is the most dangerous thing, because the vehicle may avoid stopping, resulting to the accident. This is one of the important safety rules while crossing to teach kids. Children are fast and tend to run, which you need to take care of. Teach them that running while crossing the road can be too dangerous. Zebra crossing is made on the road to allow pedestrian to cross the road and vehicles need to stop inches away from the crossing. It is an important to follow safety rules while crossing by kids and people. You can tell your kids to keep eye contact with drivers to pay full attention on the road. Kids remain in playful mood and may continue with the act even while crossing the road. One of the important traffic rules for kids to teach is not to be in a playful mood while crossing the road. If you’re along with your kids, then of course you must hold their hands. Schools are now including traffic rules and road safety lesson to teach kids. Teachers teach traffic rules for students that with signs and different methods, helping kids to learn quickly and follow them as they grow. From sign boards to practical way, it is important for kids to get trained in the early age. Make the learning of traffic rules of kids a fun activity, or else kids may not be serious in following the rules. Parents can collaborate with teachers to make the learning session more interactive. Creating imagination in their mind is the best way to teach traffic and road safety.